Patapsco High School and Center for the Arts in Dundalk, Maryland, recently completed Phase 8 of their 10-phase renovation plan, improving classrooms and student spaces throughout the 57-year old building. JMT Architecture is leading this limited renovation project, providing design and project management services for a variety of interior and exterior renovation tasks. JMT is the MEP designer and Towson Mechanical Inc. is the general contractor. Phase 8 renovations include improvements to the dance studio, art classrooms, Blackbox Theater, and Auditorium. 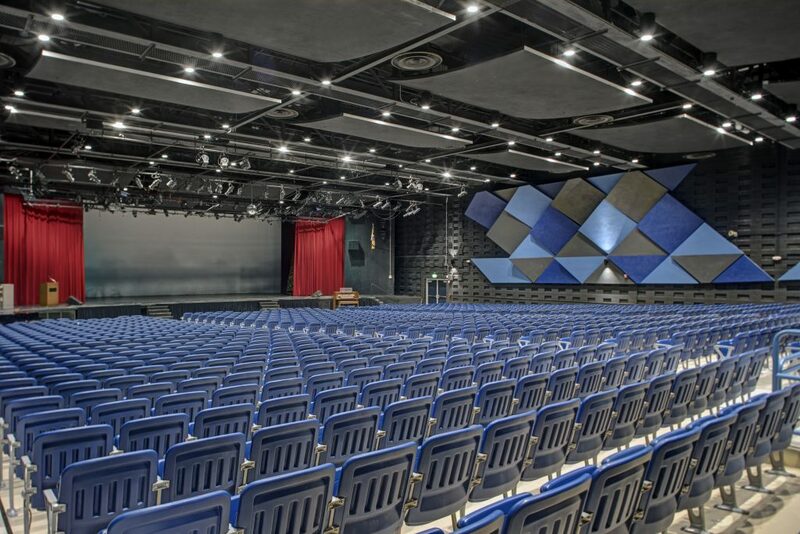 As Patapsco High School’s colors are red, white, and blue (the Patriot is their mascot); many of the finishes were selected to match, including the auditorium acoustic wall panels and new lockers. 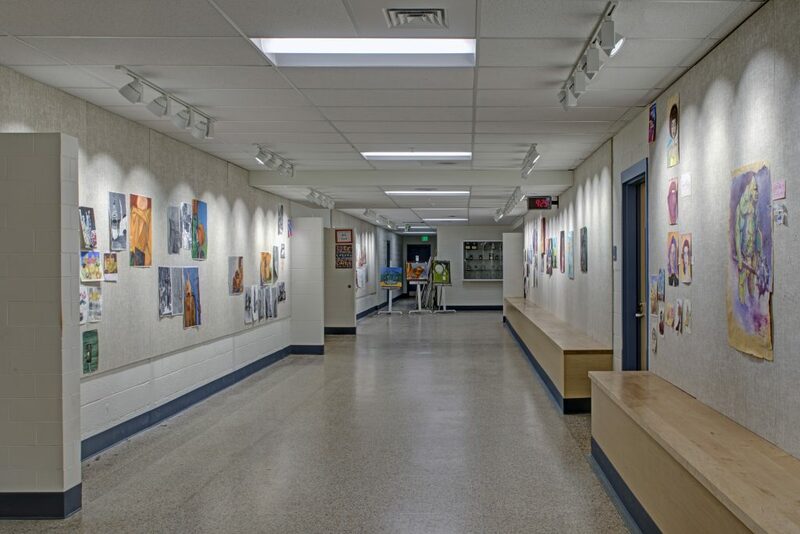 The renovated art wing showcases student sculptures, paintings, and drawings along the corridor gallery. 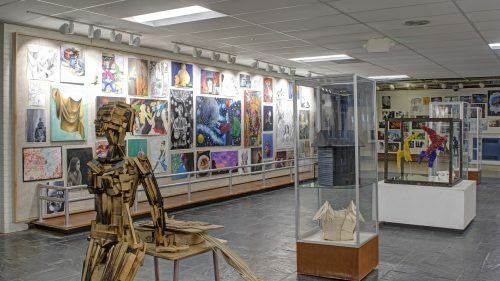 The improved auditorium lobby is a welcoming entry and gathering area where student art is also prominently displayed (pictured above). “Seeing the dated learning spaces renovated into fresh, new flexible learning environments has been very rewarding. We worked together as a team— with the school, BCPS, and the contractor— to renovate the space while maintaining budget and schedule during construction and while the building was occupied,” says Project Manager, Bill Novian, AIA, CSI, LEED AP®. Earlier phases included renovations to the hallways, administration suite, guidance suite, health suite, tech ed classrooms, and classroom wings. Currently Phase 9 is underway and includes a general art classroom, keyboarding classrooms, and TV studio. Phase 10 will occur over the summer and will renovate the library media center, kitchen, cafeteria, music classrooms, and gym locker rooms. The project construction began in June 2017 and is expected to be completed by the end of August 2019. All phases have involved work during the school year when the building was fully occupied. Patapsco High School serves 9th-12th graders as a magnet school for the arts. The High School is a Baltimore County Public School institution and serves a population of more than 1,400 students. Renovated art wing, corridor gallery.